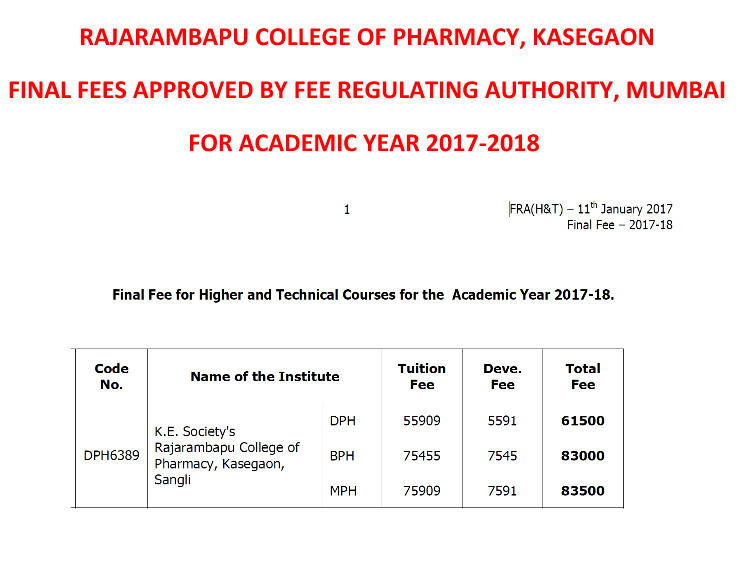 Rajarambapu College of Pharmacy - D.Pharm., B.Pharm., M.Pharm. Eligibility criteria, fees policy, admission policy and document retention policy will be as per the guidelines disseminated from time to time by Admission Regulating Authority, M. S. and Directorate of Technical Education, Mumbai, Maharashtra State. The vacancies created after this round will be filled up on following dates. * Note : As cut-off date for admission has been extended upto 31/08/2018, the date of receipt of application is also extended upto 20/08/2018 & the vacancies created due to cancellation of admission will be filled up as per new merit list. Eligibility for Admission for D. Pharm, B. Pharm and M. Pharm. As per the guidelines from Hon. Directorate of Technical Education, Mumbai, Maharashtra. Govt. of Maharashtra conducts the MH-CET examination for admission in Pharmacy degree courses, being conducted in Maharashtra State. Candidate should be an Indian National and should have passed the HSC (Std. XII) examination of Maharashtra State Board of secondary and higher secondary education or its equivalent examination with subjects English, Physics, Chemistry and Biology or Mathematics AND secured minimum 50% marks. (Minimum 45% marks in case of candidates of backward class categories belonging only to Maharashtra State) in the subjects Physics, Chemistry and Biology or Mathematics added together (Maximum of marks obtained in Biology or Mathematics shall be considered for the purpose of addition). Must have passed final year Diploma in Pharmacy Examination of Board of Technical Education (M .S.) or equivalent examination of Board with not less than 50% of marks in the aggregate of all subjects taken together at the final examination at one and the same sitting. © Rajarambapu College of Pharmacy . Best Viewed in 1024 X 768.